Yellow Crown | Fosters1537 and Yellow Crown's Club Penguin Guide! As usual, every month Club Penguin updates its membership page with points to show what’s new for members this month. 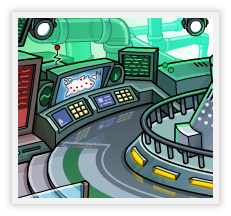 Members, set sail with Captain Rockhopper, and explore more! 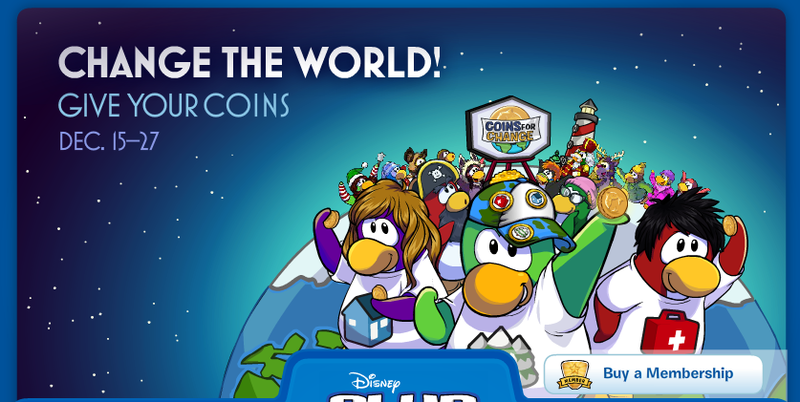 This is the second update for February 2012, seems like the Fashion Show isn’t the only party but also Rockhopper’s Quest is coming up next this very month! Members, get your looks ready for the first ever Fashion Show … and more! Be a superstar! Dress in the latest looks and own the runway. Express your creativity with your unique style! Coming soon: Pirates needed to explore uncharted seas. 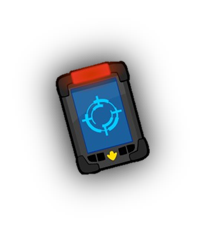 Club Penguin Field Op #66 Full Guide! Yup, Herbert DID escape! 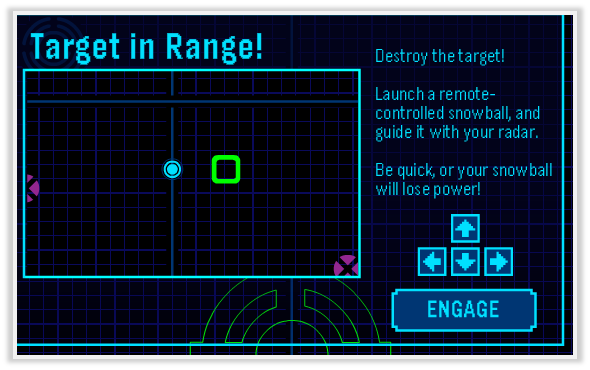 Check out the screen at the EPF Commend Room! Another week, that means it’s time for a new Reviewed By You and last time Happy77 asked what is our favorite way of earning coins. I like to save coins by being a tour guide and secret agent! It feels good because those jobs mean helping penguins and the money I get from them helps even more people world wide! I also like playing games like connect four and mancala because I get to meet all kinds of new friends and that means not only am I earning money to donate, but the person I’m playing with is too! I think it’s nice but I personally prefer Cart Surfing 😛 As for next week Happy77 asked: . If you could send a message to the kids we’re supporting through Coins For Change, what would you say? So, what do you think? Tell us in comments below! Members, dive into the new expedition in January! Coming in February: Step into the style spotlight with a special event! These are all obviously hinting for the Underwater Expedition which members will be involved a lot. But the February hint is new, my guess is possible Penguin Play Awards 2012 or a new party? 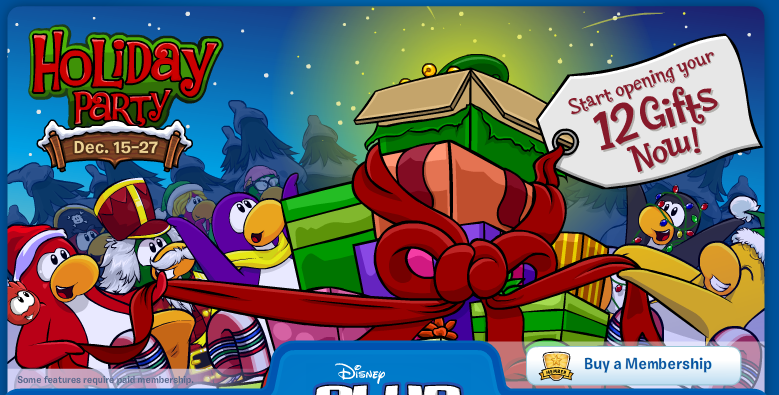 The Holiday Party log-in also has a slight update with a minor animation of penguins opening the gift on top! 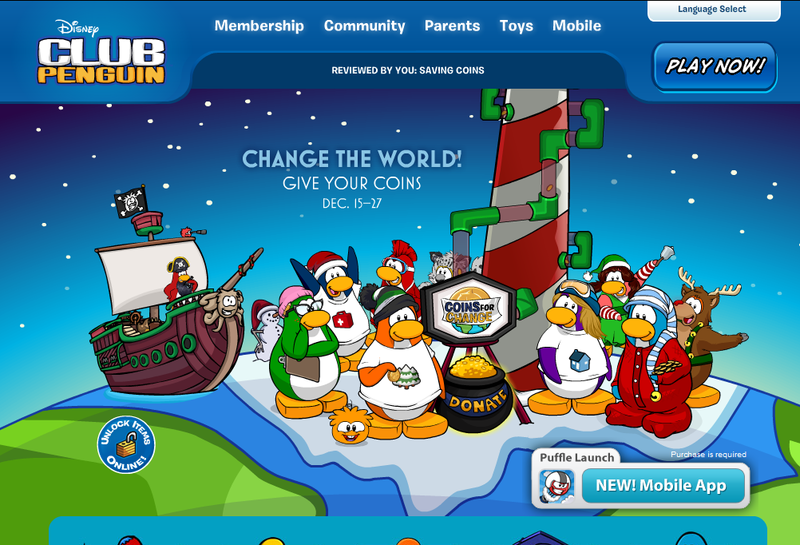 Also did you notice the HUGE Coins For Change advertisement at the homepage clubpenguin.com too? You think those are great updates, wait to see what’s IN-GAME updates!